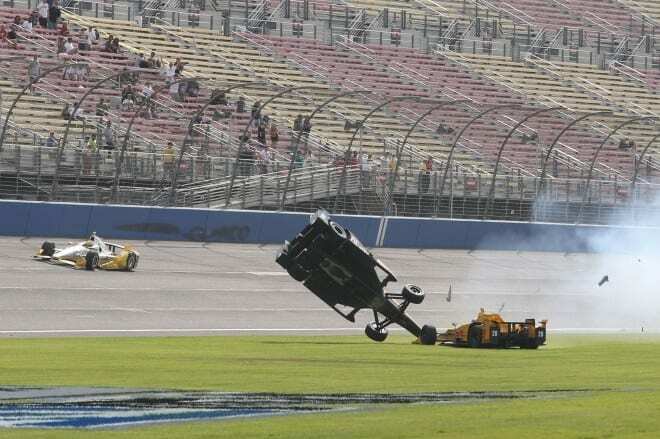 IndyCar: IndyCar Narrowly Avoids Tragedy at Auto Club Speedway – Saturday’s MAVTV 500 at Auto Club Speedway was considered one of the best races in Verizon IndyCar Series history by many fans and critics. Despite being held in front of only a few thousand spectators, the stars of the series put on an incredible pack race with 80 lead changes, a show that NBCSN and Racer Magazine’s Robin Miller called one of the five best he’s ever seen in a rant on the magazine’s YouTube page. 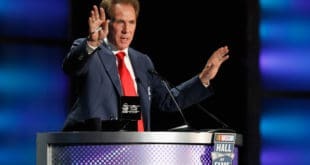 However, while viewers were amazed, many drivers publicly complained of unsafe conditions, including seventh-place finisher James Jakes, who felt the racing had gone too far. In my opinion it was too much out there today. Highlighted by a vicious final-lap crash that saw Ryan Briscoe flip into the infield, Saturday’s race delicately balanced the line between “good competition” and “too dangerous.” Unhurt and in good spirits, Briscoe remained light-hearted and grateful to be unhurt, even returning to the site of his crash. Meanwhile, many competitors, including three-time IndyCar champion Scott Dixon, were left thankful for their lives. NHRA: No Rest for the Speedy – The NHRA Mello Yello Drag Racing Series had an off-weekend this week, but teams are still hard at work getting ready for the Summit Racing Equipment NHRA Nationals from Summit Motorsports Park in Norwalk, Ohio. Alan Johnson Racing and driver Shawn Langdon head into Norwalk seventh in points and still looking for primary sponsorship to put on the side of their car. The team lost funding unexpectedly one month before the season opening race, but is doing its best to run all the races and contend for the Top Fuel championship while the search for a backer continues. In the interim, Toyota Motor Sales, U.S.A. has stepped up with funding to keep them afloat for the time being. The side of the car currently sports the Knuckle Sandwich logo, the name of strategic marketing partner Guy Fieri’s (of Food Network fame), although Fieri is merely assisting the team in the sponsorship search. Knuckle Sandwich is not a sponsor of the team. So the bottom line is the team needs to find funding if it hopes to continue. On track, Langdon and company came out of the box strong, earning a win and posting the fastest ever E.T. in a Top Fuel car (but not setting the national record as Langdon was not able to back up the run during the weekend) at the season opener in Pomona, but had some struggles as the season wore on. Short Tracks: The Northwest’s biggest paying short track race took place on Saturday at Evergreen Speedway in Monroe, Washington. The fourth running of the Summer Showdown would be dominated by a Super Late Model competitor from another region, however. 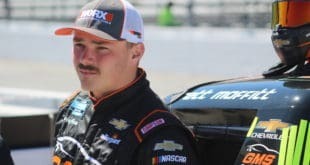 Georgia’s Bubba Pollard, who won the Winter Showdown in California back in February at Kern County Raceway Park, made another cross country trip, claimed the pole, and led the most laps in the 200 lap feature around the .646-mile oval. 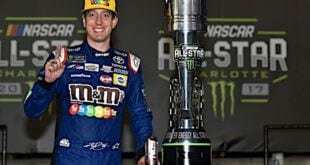 The event, which was won in 2014 by current NASCAR Camping World Truck Series driver Cameron Hayley, was slowed early by a lap two red flag when several of Pollard’s closest competitors were involved in a pileup that was initiated by another car putting down oil. In the second half of the event home state driver Tayler Riddle took the lead for a short portion before Pollard passed him back and led for the rest of the way, taking home the $25,000 first prize and a $10,000 bonus as the best combined finisher between the Winter Showdown and Summer Showdown events. Sports Cars: Watkins Glen = Slippy and Raw – This past weekend, IMSA descended upon Watkins Glen International for a weekend of racing. With the rains that moved in Saturday, much of the weekend’s action was in the rain. The start of Saturday’s IMSA GT3 Cup race descended into farce. Both Saturday’s Continental Tire 150 for the Continental Tire SportsCar Challenge and TUSC’s Sahlen’s Six Hours at the Glen were red flagged at one point due to heavy rains and standing water on-course. The start of Sunday’s race was in mixed conditions, resulting in the classes being mixed up due to team’s tire selections. Add in the fact that it the temperatures were nearly 20 degrees below and that makes for quite the weekend. Wayne Taylor Racing had a good chance to win Sunday’s endurance race, but Ricky Taylor wiped out of the lead with 42 minutes remaining exiting turn 10. Taylor’s Konica Minolta-sponsored Chevrolet Corvette DP Evo caught the painted curb exiting the corner. In wet conditions, such a move is a no go. Taylor immediately lost control and spun into the tires. After Taylor resumed, Joey Hand tried to pass Taylor in turn 11, only to wipe out himself. Luckily, Hand did not hit the barriers and continued, eventually finishing second. Pit strategy and putting yourself in the right place at the right time was crucial as both primary races ended up finishing under yellow at least partially due to the rain. Saturday saw Stevenson Motorsports’ Robin Liddell and Andrew Davis share the No. 6 Chevrolet Camaro Z/28.R to overall victory in a race that was neutralized for the last 36 minutes due to a crash and standing water. In Street Tuner, it was CJ Wilson Racing’s No. 5 Mazda MX-5 of Stevan McAleer and Chad McCumbee that dominated to take the victory. For the former Camping World Truck Series regular, it is his first career CTSC victory. 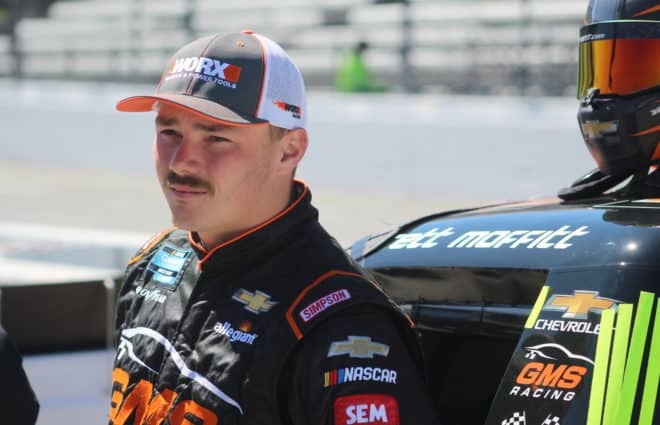 XFINITY: Preparing for the Unknown at Daytona – After an off-weekend, the XFINITY Series returns this week to the high-banked Daytona International Speedway on Independence Day. With many unknowns, as per usual, Daytona provides a chance for someone to emerge as a title contender. 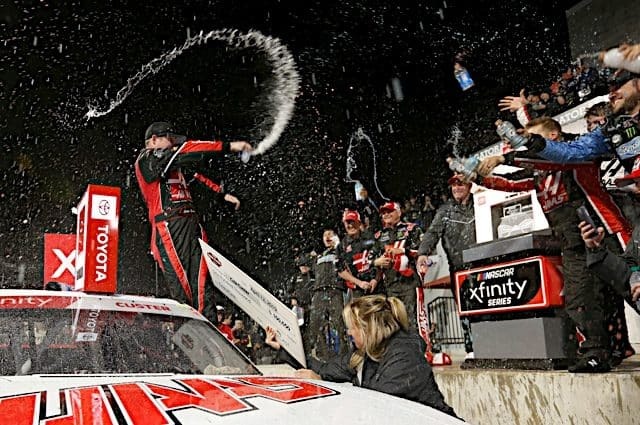 Ryan Reed captured the checkered flag at the season-opener, but since then, Chris Buescher has been the only full-time driver to win any races in the division. Expect to see an added level of intensity on Saturday evening. 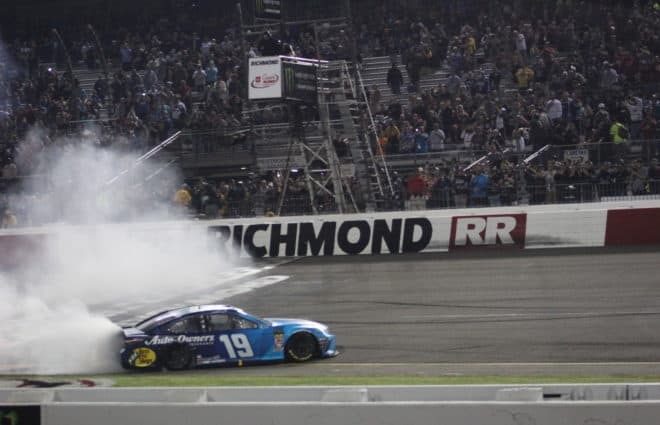 Reed’s victory didn’t do much for his season, but it proved he can win in NASCAR competition. 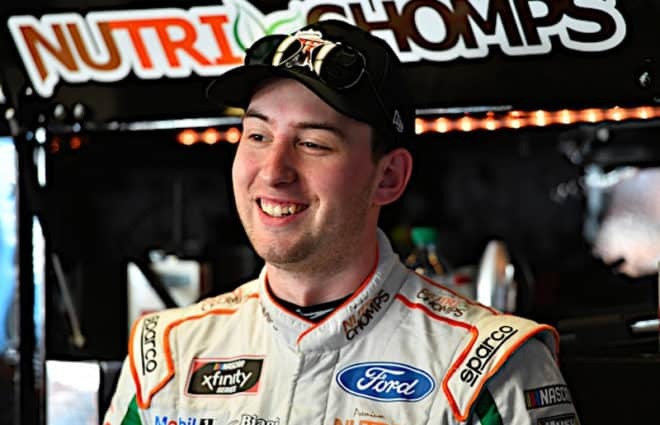 If a driver like Dakoda Armstrong, one of the TriStar Motorsports drivers or even someone from JD Motorsports can sneak in a solid run at Daytona, it could go a long way in their hopes at gaining momentum in the second half of the season. Formula E: Piquet Jr. Ekes Out Championship – To conclude the inaugural Formula E championship this weekend, the series held two races in London, England on a makeshift street circuit Battersea Park. 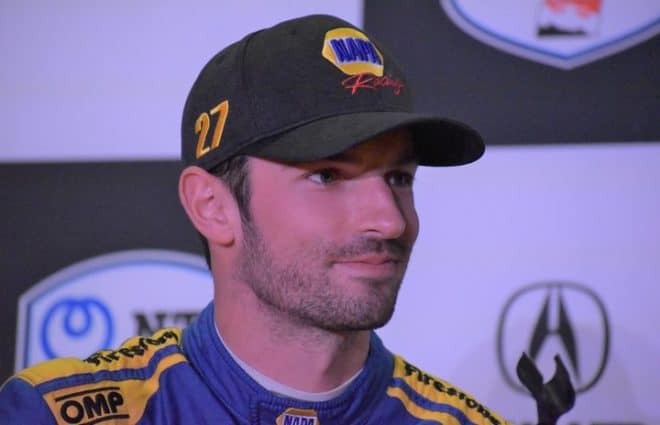 Nelson Piquet Jr., who seems like he has raced he raced in every series under the sun except MotoGP, entered the weekend as the championship leader over Sebastian Buemi and Luca di Grassi. After Saturday’s race, Piquet’s lead had been cut substantially, leading by just five points. The qualifying session on Sunday would do him no favors, as his group put their lap times down on track that was substantially more rain soaked than the other two sessions. That left him to start behind his two main rivals in 16th. Off a brilliant start, Piquet jumped up to 12th and held that position for much of the race, while Buemi, sat comfortably in eighth – and atop the points. Thanks to both attrition and driver errors, Piquet made his way into the points, moving into 10th, and continued to climb, while Buemi could manage to get only as high as sixth – unable to pass Bruno Senna. Leader Stephane Sarrazin, looked to earn the race win but with his battery at nil when he crossed the line he endured a 49-second penalty that gave the win to Britain’s Sam Bird. Next Kickin’ the Tires: Was a ‘Brotherly Shove’ Imminent at Sonoma? Gladiators willing to trade their lives for competition, fame and riches. I watched and was thoroughly entertained. I’ll say again, there is entertainment value added when there is an ever present element of danger. I cringed when Brisco’s nose speared the dirt and was glued to the TV. How did a pack race slip through the cracks? Did Indycar put down force back in the cars since Texas? Formula E is sparking my interest too. The fact that USA has representation in Andretti and Penske on the world stage makes it worth following. The track in London sucked and the 2 car format needs work but they are on to something at the leading edge of technology. Also, get rid of that fan boost vote crap.